Keep your system in great shape! Register now to receive a reminder to retreat your sewage system every year. Roebic products were featured on the Weather Channel's "Wake Up With Al" segmenet titled "5 Things to Do to Your Home in 2015". our customers have trusted in Roebic products to help maintain their septic systems. As a leader in the treatment of wastewater, our products are used by sewage treatment facilities, industrial complexes, restaurants, hotels, farms and homeowners. Roebic has the knowledge and experience it takes to help each of our customers with their septic related problems no matter how large or small. Our knowledge is based on years of research and experience that we incorporate into every one of our product formulations. Many of these formulations contain our own patented enzyme producing bacteria. 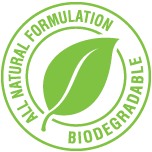 Our products are also biodegradable and will not harm the environment. The results are a no-nonsense proprietary product line that is widely recognized for its superior performance and quality. For all your system maintenance needs trust Roebic, because there are no substitutes. Read more about Roebic Laboratories.